A Warminster parish workhouse was erected in in about 1727 at Warminster Common by Lord Weymouth. In 1757, Lord Weymouth paid the parish £300 for the right to inclose some common lands and the money was used towards the building of a new workhouse at the south of what is now Brook Street. Accommodating up to 100 inmates, it cost about £500 and was built by Simon Coles of Warminster. Following its opening, all out-relief for the able-bodied in the parish appears to have been withdrawn. Inmates of the workhouse were engaged in the production of cloth. In 1821, the workhouse was described as 'a most grievous concentration of every species of vice'. After its closure in 1837, the former workhouse was used for silk-spinning. 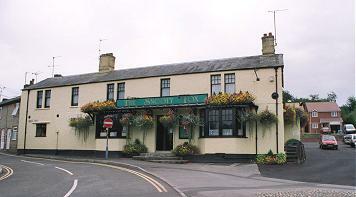 Parts of the building survive in what is now the Snooty Fox pub. Warminster former parish workhouse from the north, 2001. A parish poor-house also existed at Corsley — a thatched building at Upper Whitbourne which could accommodate 30 paupers. In 1777, a parliamentary report recorded parish workhouses in operation in Warminster (for up 120 inmates), Corsley (50 inmates) and Horningsham (also 50 inmates). County of Wiltshire: Bishopstrow, Boyton, Brixton Deverill, Chitterne All Saints, Chitterne St Mary, Codford St Mary, Codford St Peter, Corsley (2), Heytesbury (2), Hill Deverill, Horningsham (2), Imber, Knook, Longbridge Deverill (2), Norton Bavant, Sherrington, Stockton, Sutton Veney, Tytherington, Upton Lovell, Upton Scudamore, Warminster (6). The population falling within the Union at the 1831 census had been 17,150 with parishes ranging in size from from Hill Deverill (population 129) to Warminster itself (6,115). The average annual poor-rate expenditure for the period 1833-35 had been £12,971 or 15s.2d. per head of the population. Warminster Union workhouse was erected in on a three-acre site known as Boot Field at Sambourne to the south of Warminster. The Poor Law Commissioners authorised an expenditure of £7,000 on construction of the new building which was to accommodate 300 inmates. Building work began in the spring of 1836 and was completed by December, though owing the death of the contractor John Ralphs, was not handed over for another month. Heating stoves and kitchen equipment were provided by the firm of Carson and Miller. The building went into use in February 1837 and, at the first Guardians' Board meeting in the new premises, the Master complained about continuing shortages of water which was blamed on Carson and Miller's plumbing. The Guardians also ordered strong oak gates to be erected across the entrance. The workhouse was designed by Sampson Kempthorne who was also the architect of many other early Union workhouses, although Warminster was his only construction in Wiltshire. 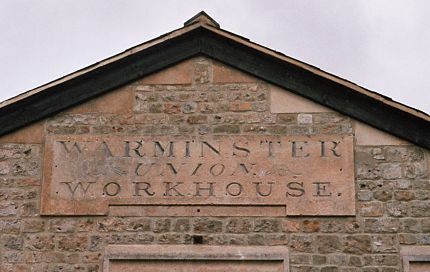 His design for Warminster was a variation on the model hexagonal or "Y" plan published by the Commissioners in 1835 (all the other Wiltshire unions adopted Kempthorne's model "square" plan for their new workhouses). A two-storey entrance and administrative block stood at the east, behind which lay the chapel and dining-hall. The hexagonal hub contained the kitchen on its ground floor with the Master's quarters above from which views could be obtained of all parts of the site. Males were accommodated in the northern parts of the building and females at the south. The outer hexagonal perimeter contained receiving rooms, stores, workshops and utility rooms, mostly single storeyed. The site location and layout are shown on the 1924 OS map below. Warminster entrance block from the north-east, 2004. Warminster from the south-west, 2004. The diet at the workhouse followed one of the Poor Law Commissioners official dietaries, with gruel for breakfast, and a dinner consisting of either bread and cheese, soup, or on two days a week, meat and vegetables. However, the quality of the food apparently left much to be desired. A recollection of workhouse life in 1830s by former inmate Harold Price recounts that one day, a piece of bacon was so tough that it was kicked around the yard like a dirty tennis ball. In 1872, the Local Government Board reduced the official capacity of the establishment to 130, necessitating enlargement of the accommodation. The workhouse closed in 1928 with vagrants being sent to Frome, and the aged poor going to Westbury. In 1930, the premises reopened as Warminster Public Assistance Institution under the control of the Wiltshire Public Assistance Committee and operated as an old people's home and hospital. In 1938, a new block for vagrants was erected at the north-west of the site. In 1948, the institution became part of the new National Health Service under the name of Sambourne Hospital. However its provision of 'welfare' care continued until 1962 when a new County Council home was opened at Portway. Sambourne continued in use as a geriatric hospital until the mid-1990s when the former workhouse buildings were redeveloped as housing. Wiltshire and Swindon Archives, Wiltshire and Swindon History Centre, Cocklebury Road, Chippenham SN15 3QN. Holdings include: Guardians' minutes (1835-1913); Ledgers (1836-1923); Annual returns of pauper lunatics (1842-99); etc. The Victoria County History of Wiltshire , Vol XXII, Oxford University Press.